Bangalore: In the wake of the violence targeting Christians in certain parts of Karnataka, opposition parties and political analysts are accusing the state’s Bharatiya Janata Party, or BJP, government of showing its true colours, while the party itself claims its opponents are out to make a political issue out of the events. “Karnataka has emerged as the worst terror and communal hub in the south," Janata Dal (Secular) chief and former prime minister H.D. Deve Gowda told a press conference on Monday. Gowda’s party was the BJP’s coalition partner in the state’s previous government. “The opposition is talking without going into the cause of the issue," said Karnataka home minister V.S. Acharya, who hails from the coastal district of Udupi where some churches were attacked on Sunday. “The cause was illegal conversions, but this should not have precipitated (into) violence. They should have given complaints to police." On Sunday, around 12 churches were attacked in three parts of the state—Dakshina Kannada, Udupi and Chikmagalur—by groups suspected to be affiliated to the BJP. The attacks came after similar ones in Orissa’s Kandhamal region. In both cases, they were prompted by alleged conversion activity by the churches. Sangh Parivar is a term used to generically describe the BJP and its affiliates—the Vishwa Hindu Parishad and the Rashtriya Swayamsevak Sangh. Coastal Karnataka is home to around one-fourth of the state’s Christian and one-tenth of its Muslim population. The area has emerged a BJP stronghold, and clashes between communities have become common over the past few years. On Tuesday, Karnataka chief minister B.S. 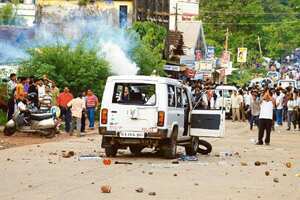 Yeddyurappa announced that nearly 171 people, including Bajrang Dal activists, had been arrested by the police. The Bajrang Dal is another affiliate of the BJP. The clashes and their aftermath are the latest in a series of events that have given the Yeddyurappa government a religious tinge. In his first month in power, Yeddyurappa had to withdraw a government order issued by the minister for endowments asking all government-controlled temples in the state to offer prayers for the chief minister every day. Meanwhile, the government is trying to resolve a protest among Hindu mutts, which are divided over an attempt to hand over a state-run temple in Gokarna to Ramachandrapura Mutt. “Everybody feels we have to develop the temple, but how we go about it has to be sorted out," said Vishveshwara Hegde Kageri, the state’s minister for primary education, who attended a meeting of Hindu religious leaders on Monday. However, Kageri himself is facing criticism from the opposition that is backing Christian educational institutions over a government move to penalize them for violating norms. On 29 August, Christian schools in the state remained closed to protest the violence against Christians at Kandhamal. Since a majority of them were schools funded partly by the government, the education department issued notices to them for closing without prior permission. “When schools are closed for other issues like the Amarnath (land transfer row) and the Ram Sethu (controversy), no questions were raised," said H.T. Sangliana, a BJP parliamentarian from Bangalore, who was expelled from the party for cross-voting for the ruling United Progressive Alliance in a 22 July trust vote. “They are making an attempt (at a saffron agenda). But it may not succeed in some of the urban parts (of the state)," said Sudha Pai, chairperson of New Delhi-based Jawaharlal Nehru University’s Centre for Political Studies. “The BJP cannot hide its agenda, just as the Congress did for long by wooing backward classes and minorities," said Dharma.